Breanish Tweed | Luxury handwoven textiles. I’ve woven some more lambswool shawls in our machine woven Macleod range. Here are a couple of pictures below, please get in touch if you want to find out more. I also have shawls in a soft shetland wool in greys. Permanent Style is one of my favourite blogs on style and menswear, really in-depth articles done with great eye for detail and knowledge about the industry. If you haven’t visited, I’d really recommend it – it has grown into a real resource, independently minded and highlighting some wonderful companies. We wove a tweed for Permanent style after Simon visited us on Lewis. Here is a link to the article written by Simon Crompton and I have also pasted it below. Some great photos by Andy Barnham as well. Oh yes, and I’d really recommend Simon’s Book – The Finest Menswear in the World. Breanish Tweed has all the hallmarks of a Harris tweed weaver: old single-width looms stored in draughty sheds; decades of experience in hand weaving; a stunning but hostile location that constantly reminds one of tweed’s insulating properties. But Breanish is deliberately not Harris Tweed. Breanish falls down in several key respects. Its wool does not exclusively come from the Blackface and Cheviot sheep on the island. That wool is not woven by one of the islands’ three mills. And most of its tweed is too lightweight. Legally, therefore, it fails. But in terms of craftsmanship, it is as good if not better than the other tweed weavers on Harris and Lewis (the two halves of what is essentially one island). 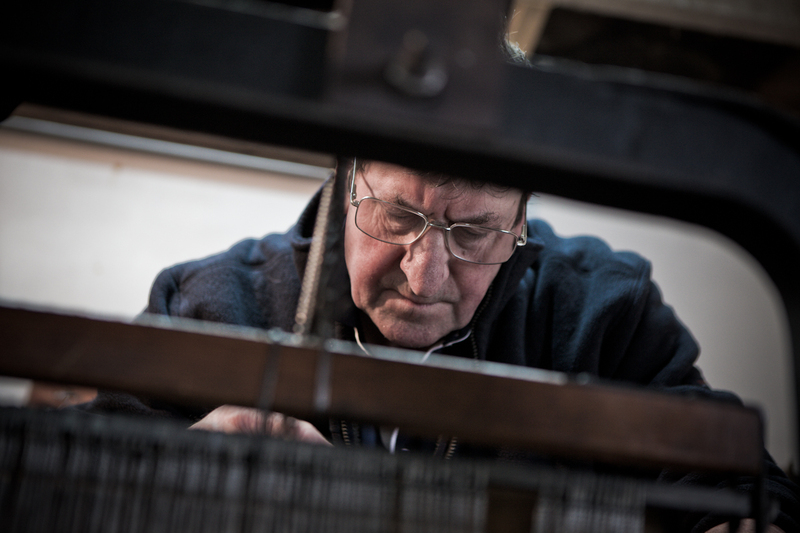 There are over 100 tweed weavers on the island, mostly one-man and one-shed operatons. Yet Breanish is one of only about a dozen left that use the old single-width looms. It has two of the old Hattersleys, one 40 years old and one over 90 (shown top). Most weavers don’t want to use these cumbersome, iron machines – the younger one, Bertha, was bought by Breanish for a bottle of whisky. Several more are stored in a separate shed, to supply spare parts. Breanish is also the only weaver on the whole island to still do its own warping. This involves stripping off the yarn from the cones supplied by the mills and lacing them by hand around a wooden frame about three metres wide (above). The resulting length is pulled off in plaits, before being ‘beamed’. That requires the wool to be run across two beams in the roof of the shed, with one man holding it down to retain tension, and then wound onto a big metal drum (below). Beaming adds about two hours to the total of two days that it takes to weave 40-60 metres of tweed. But it enables Breanish to do much smaller runs because it doesn’t have to reply on the warp supplied by a mill. This is one of the reasons why Breanish started weaving more unusual cloths, such as cashmere, lambswool and vicuña: it was only economical in these smaller runs. As a result, Breanish has now become unique in the world of luxury, handwoven wool. It supplies everyone from Norton & Sons to United Arrows. 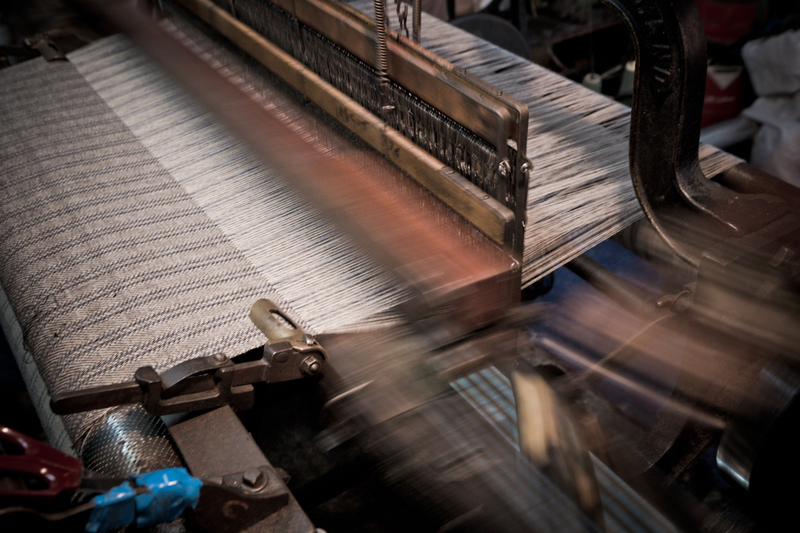 Breanish’s weaving style of 2x1or 2×2 depending on the pattern (that metric refers to the number warp threads to weft threads) is also exactly the same as Harris Tweed. 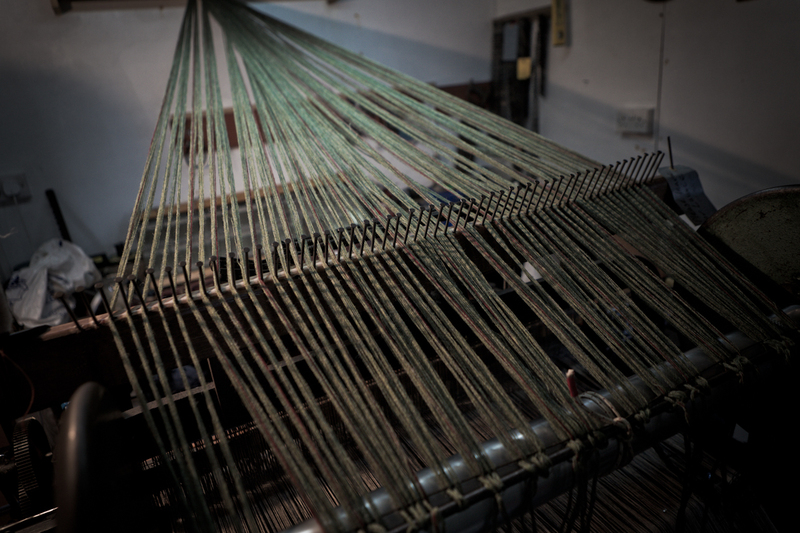 It is possible to weave one by one (a traditional plain weave) but that requires a restructuring of the loom to shift to from four boards to two. And it makes no difference to softness or longevity – that’s down to the wool used. Breanish’s small runs also mean it can do bespoke orders for those that take the time to visit, and a post next week will give the details on a Permanent Style tweed that I designed while up on the tip of nowhere. It’s a nice subtle herringbone with heather woven in, using the Shetland wool that is slightly softer than the more traditional Harris Cheviot. It will be available to order throughout December, at a special discount for Permanent Style readers on the normal bespoke price. The tweed will then be woven in January and delivered in February. This trip was part of the research for an upcoming book, The Finest Menswear in the World, based on visits to factories and ateliers around the globe. More details here next year. 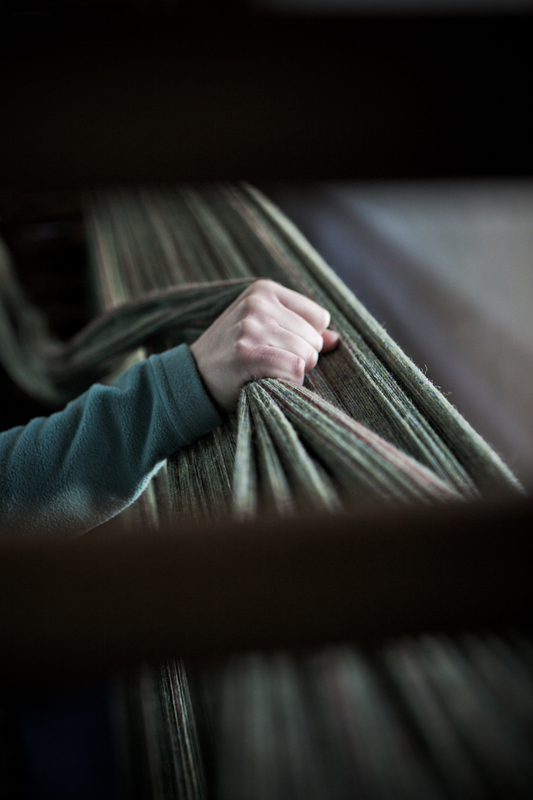 Here is a link to some images of the weaving process – my parents Donald and Chrissie are in the photos. I’ll try again to embed them in the post, wordpress didn’t seem to take to it this time, so here is a wee google album. I’ll be adding a few photos to this google photo album which you can look at – from classic tailoring using Breanish Tweed, to new patterns. I’ve had quite a few requests to put some patterns up, so I’ll do that. Feel free to ask if there’s anything you’d like to see! Just past in the weird looking link below. Breanish Tweed now has a youtube channel – I’ll be posting videos related to textiles, craft and the Western Isles, so please follow if that is of interest. Many thanks. I think you can search for breanishtweed on youtube – or paste in this crazy looking link below. Here is a link to a short three minute promo showing how Breanish Tweed is made, and giving a little information on our different cloths. No sooner is it in the door than this poor tweed is off to Vienna. I’m sure it will be very happy there, I know I was.